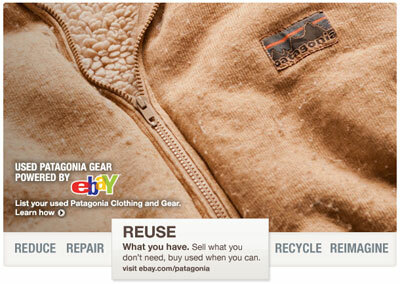 Outdoor clothing maker Patagonia has partnered with Ebay in what they are calling the Common Threads Initiative. The company wants people to Reduce the amount of clothing you buy, Repair what’s broken, Reuse — sell or pass on older gear, Recycle by keeping clothes out of landfills and Reimagine a world where we take only what nature can replace. Watch a more comprehensive video on the project or purchase used gear.